Longines’ latest vintage-inspired wristwatch is the Pulsometer Chronograph, modelled on early wrist chronographs of the 1920s made for medical personnel. The Pulsometer Chronograph sticks to a tried and tested Longines recipe: a believable and authentic vintage aesthetic with a reliable modern movement. And of course the incongruous date function. The concept isn’t new, but the watch is well made, decently priced and feels honest. At 40mm in diameter the case is a good size, rounded and polished all round, feeling like a pebble. The finishing is plain and simplistic, but it’s appropriate for the design and price point. Like many other similar vintage-styled watches the Pulsometer Chronograph seems smaller than it is, which suits the styling. Notably, the Pulsometer Chronograph costs almost exactly the same as the Heritage Single Push-Piece Chronograph introduced in 2013 that’s equipped with the same movement. But the more modern case design of the Pulsometer Chronograph makes it a more practical watch; the wire lugs of the Single-Push Piece seem affected in comparison. Finished in white lacquer to approximate the enamel dials found on the original 1920s watches, the dial is very well done. The proportions and fonts are spot-on. And the blued steel Breguet hands look right at home. The red scale on the edge of the dial is a pulsometer, intended for doctors or nurses to measure a patient’ s heart rate. Watches with such a scale are often known as doctor’s watches. What does look out of place is the date window at six o’clock, something that afflicts all Longines Heritage models (examples here, here and here). For historical correctness the date window should be banished, but practicality and commercial sense (date windows are popular with the average buyer) prevents that from happening. Crop out the date and it could almost pass for a vintage watch. But that is a one drawback with what is a well executed watch. The movement inside is the L788.2 (also known as the ETA A08.L11), which is a heavily upgraded version of the Valjoux 7750, the most common mechanical chronograph movement on the market. A basic but robust and reliable movement, the 7750 is hardly a 7750 any more. The L788.2 is improved with a column wheel as the on-off switch for the chronograph mechanism, replacing the more down market cam of the 7750. It also boasts a 54 hour power reserve, slightly longer than the 42 or 45 hours of the stock 7750. And it is a single-button chronograph, meaning the button in the crown is responsible for start, stop and reset. The mono-pusher chronograph mechanism is a key element of the vintage look, having two buttons on the case would have spoiled it. As is typical for a Longines, the Pulsometer Chronograph is accessibly priced, retailing for US$4200, S$6360 or SFr4000. 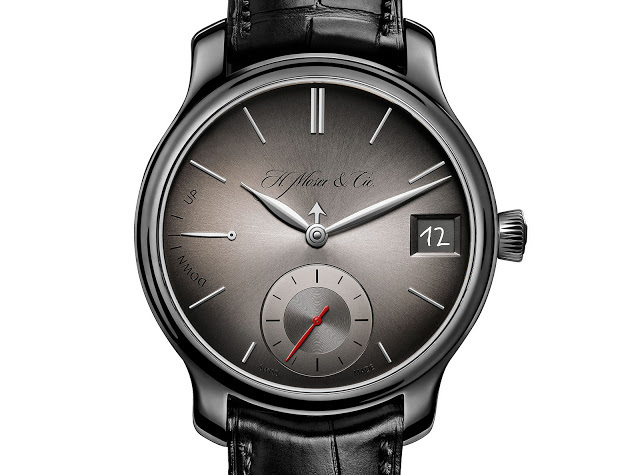 H. Moser & Cie. has created a unique version of its cleverly constructed, minimalist Perpetual Calendar for Only Watch 2015, featuring a black titanium case and a date disc with hand-written numerals. One of the most original perpetual calendar movements on the market, the H. Moser & Cie. Endeavour Perpetual Calendar is clear, concise and exceptionally legible. Moser has created a one-off specimen of the perpetual with a diamond-like carbon (DLC) coated titanium case and dark grey fume dial for Only Watch 2015. The case is made of polished titanium, giving it a glossy black finish with the DLC coating. 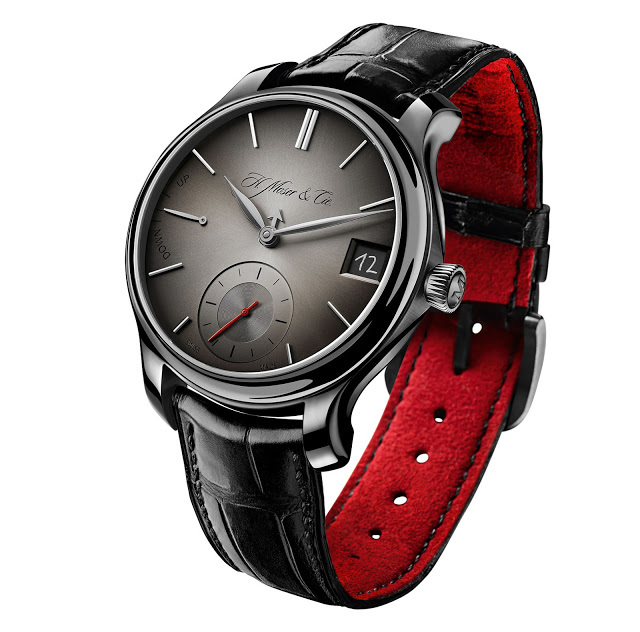 A red lacquered seconds hand and matching strap lining livens up the monochromatic colour palette. And then there’s a thoughtful but subtle detail: because Only Watch raises funds for research into Duchenne muscular dystrophy, a disease that affects young boys, the 31 numerals on the date disc are reproductions of numerals hand-written by the children of Moser’s employees. The HMC 341 movement inside has a seven day power reserve, as well as the Strauman Double Hairspring, two identical balance springs fitted over one another, each moving inversely to the other. 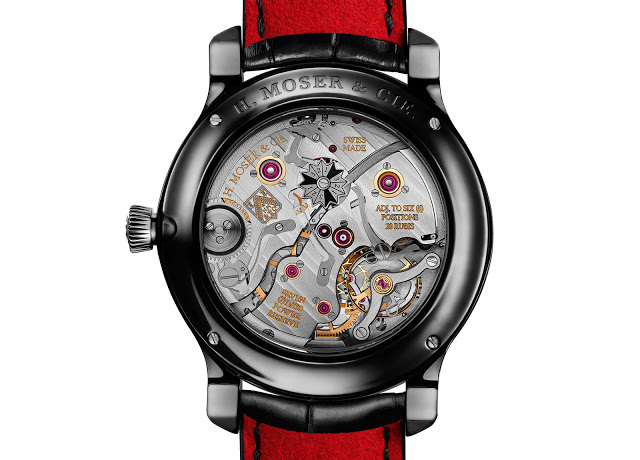 Found only on limited or special edition Moser timepieces, the Double Hairspring improves timekeeping by improving the concentricity of the hairsprings’ motion. The Endeavour Perpetual Calendar Only Watch will go under the hammer on November 7, 2015, with all proceeds raised going towards supporting research into Duchenne muscular dystrophy.